Vocational Options of Hoke County visitors are welcomed just inside the main entryway by hallways lined with distinctive designs and artwork created by the day program’s participants. Visitors are also greeted by the beaming smile of VOHC attendee Glen Butler. It’s hard to miss Butler’s bright, happy face upon entering the main gathering area at VOHC, located in Raeford. With his engaging personality, Butler is considered one of the day program’s official greeters. Now, Butler is not only known for his warm smile but for a unique artistic creation. Butler has recently become noted for a piece of artwork that is growing in popularity – a shaggy dog. The adorable puppy productions have generated anywhere from $25 to upwards of $150 per piece in sales. Developmental Specialist Angela McCalister says Butler enjoys creating the dog artwork from start to finish. Butler smiles as he proudly shows a creation that he recently began. Butler, 54, makes the dog’s body out of papier-mâché. Once dried, he cuts yarn and glues the pieces to the body, creating a shaggy appearance. McCalister notes that those who have purchased Butler’s creations have asked for his autograph on the bottom of which he gladly accommodates. VOHC staff are supportive and encouraging of Butler’s talents and success. “Despite a long absence early this year due to medical challenges, Glen is back on track. Through hard work, perseverance and sheer determination, Glen has returned to creating his artwork,” explains Support Coordinator Pauline McGuire. Due to the popularity of Butler’s shaggy dog design, Hurst says the VOHC team is currently researching a micro enterprise option as a way to sell his pieces. 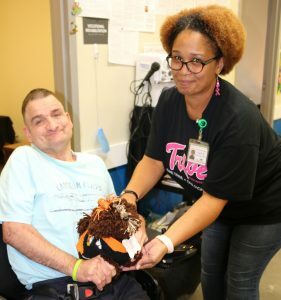 Photo caption: Left, Glen Butler shows his latest shaggy dog creations with the help of Developmental Specialist Angela McCalister.